O (Observation): A popular notion in Ezekiel’s time was that the sinfulness of the father (given a patriarchal society, mother’s were not given consideration) could be visited upon the son (again, patriarchal society). So, many in the Hebrew faith began to believe that the children might be paying for the sins of the parents. How? By being punished through oppression, sickness, and death. But no longer is that supposed to be the way they should think, now that God has spoken through Ezekiel. Each generation is set free from the parents’ iniquity. God makes no connection between the sins of a child to the sins of the parents. Will both still sin at times? Yes. But will the child get a clean slate? Absolutely! 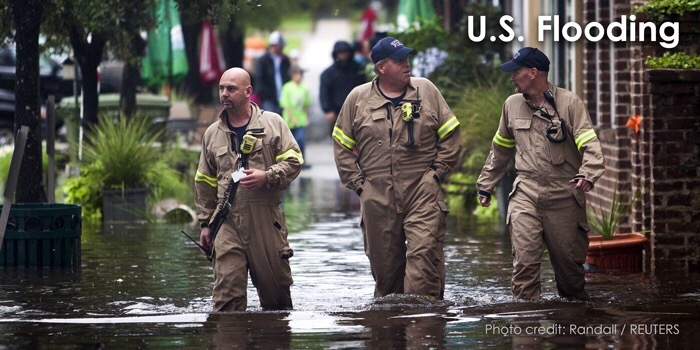 A (Application): The flood waters in Columbia, SC, and throughout the great Palmetto State have arisen and destroyed many homes, and in some cases, have caused injuries and death. I hear people blame the sins of our parents for the direction our country is going. Or they take a look at our sins, and worry that we will put our children in a worse position with God. Every time I hear someone say that we are reaping what we sow, I come back to these verses from Ezekiel. Will God visit the repercussions of our sins upon our children? I think not. We are brought into a relationship with Christ, with the God of Abraham, Isaac, and Jacob, who wishes LIFE for us, not death. We can look at the world around us and see how we can participate in bringing life and sustenance where death and devastation have taken place. We can do that, because God equips us to do that work. And some times, rather than caring for our neighbor, or creation, we will be the recipients of the care of others. Christ’s death and resurrection allows us the space to seek forgiveness and for each new generation to start fresh. God’s grace brings us wholeness and life. God’s grace exchanges our failures for an abundant life. Here is one way to help…through the ELCA’s Lutheran Disaster Response. You can Pray, Give, and Connect. I hope you do. P (Prayer): Lord, your grace washes us clean. You transform our failures into ways that we can reach out to help our neighbors. Please be with all who suffer from the floods in South Carolina, and wherever floods devastate. Amen. This entry was posted in Digging Daily and tagged Carolina, Flood, Grace, Sins, South. Bookmark the permalink. This reminds me of children years ago who were called a certain name just because they were born out of wedlock. As if they had anything to do with it. When buying property within 50 miles of a dam, be *sure* you find a spot that is elevated *above* the dam.